Unmovable, is my ability of forgetting why some occasion from my life perplex me. Sometime during my childhood, I inherited an object. I vaguely recall the person I obtained it from, referring to it as a puzzle box. Though I didn’t note any association between “Lamentation Configuration,” and the origami version of this paper object the characteristics of the two are present now. Through the years our entertainment industry’s presented to us popular movies like “Hell-raiser,” and television shows like “Star Trek: The next generation.” Strangely, I forgot about existence of the paper box until after the turning of the millennium. 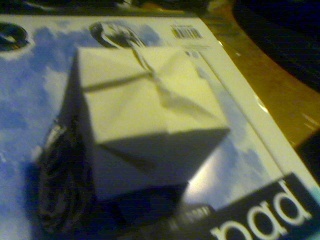 After the turn of the millennium, I began crafting the paper box again. I didn’t think “Cube” was important during the millennial turning. “Lamentation Configuration” met all the standards of Christian fan-fiction, and The Federation encounters of Borg Aren’t mere coincidence. Though entertainment’s evolution, might imply “Deanna Troy” of “The Star-ship Enterprise” is a fan-fiction of fan-fiction. After the millennial turn, I began crafting the paper box. Wondering why the paper box adopted the character of a puzzle, I notice, perhaps the paper box was given to me as a less than perfect object. Now , in betwixt heaven and hell, I imagine why Clive Barker created. Clive Barker had an obvious perception of that inherited balance. Even more important, I ask how much longer I’ll tolerate society destroying the same legacy. Wikipedia refers to this origami box as the “Kawasaki box.” Origami is something I suspect exists as a part of Shinto practice. A geometric approach to origami resulted in a conclusion, origami objects share a fundamental accord. Each traditional object triangulates around at least one right angle triangle, and each object shares more than one geometric shape. Coincidentally, “Cube” and “Xbox,” were among iconic products presented to the public during the turn of the millennium. I’d upload many provocative Silverlight videos of myself naked and inviting everyone to join me, but I’m thinking my blog would be equally good a place to post them. Though my material’s likely to get some attention my point would still be justified by reading habits of ordinary readers. Addition of polls is a costly one. I can’t hold my head off my desk long enough to create a Poll Daddy account for entertaining myself. I’m asking myself why create one for any other purpose. Due to the traffic my queer posts get subjected to, not only are there more negative phrases and words in the English language, but people seek those things for reference. Because I’m a sinner those videos can potentially ease the negative aspects of life and humble savage hearts. I’m convinced pleasure’s gratifying for everyone. Xbox gamers report people for anything, but blog readers thrive in the depths of sinister things. If everyone inherited the head and the tail perhaps fathoms more we’ll venture eventually rediscovering us. I’d hope all those naked celebrities despite their anguish from being exploited due to their convictions give me good ratings. Naked celebrities verses naked sinners of prodigal type. For all the bloggers I love; those hours of sleep are long and a waste of time. My days drag on and My body’s growing with them. Game to live! !